A trip to a warehouse bookstore in the middle of nowhere produced a great find! I had just about given up the hope of finding something interesting until this book caught my eye: Nonquitt A Summer Album, 1872-1985, edited by Anne M. Lyell. What is so significant about Nonquitt? This is where Louisa May Alcott spent her summers in the last years of her life. This book was such a great find because of new pictures of Louisa, her nephews, the cottage she rented and the summer home she eventually purchased. The book devoted a short chapter (chapter 9, pages 94-97 – all references come from these pages unless otherwise noted.) 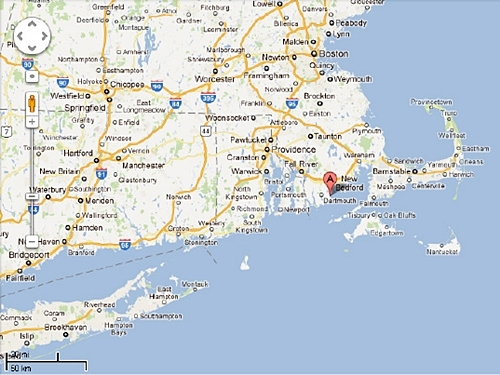 to Louisa with anecdotal stories of her summers in the southeastern Massachusetts seacoast town near New Bedford. 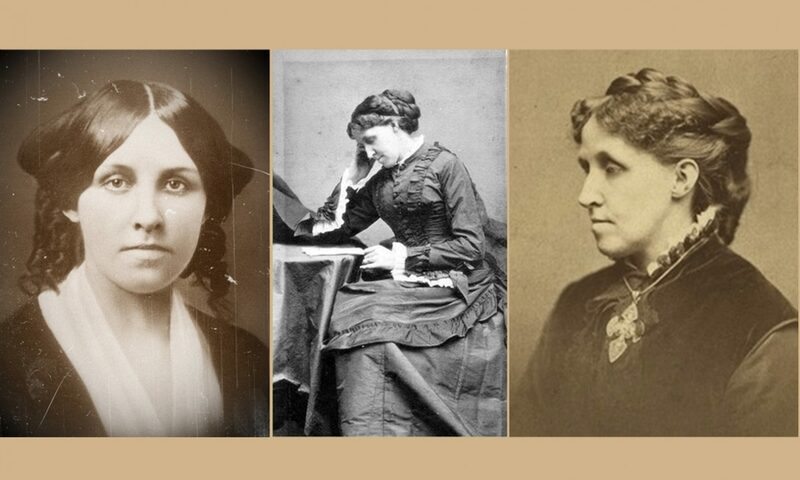 What brought Louisa May Alcott to Nonquitt? Louisa was in her late forties at the time, obviously showing the ravages of her constant battle with her health. Remembering how vibrant she once was, it is sad to read how much her poor health had aged her. Louisa rented a house in 1881, sharing it with her niece, then 2-year-old Lulu (daughter of younger sister May who had passed away soon after childbirth). Her older sister Anna also summered at the cottage with her two teenage sons, Fred and John. 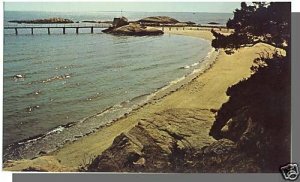 Anna writes, “I went to Nonquit[t] where Louisa had a cottage, a lovely green paradise which offers everything one can wish. Here I rested, and for fun got up theatricals (as usual), charades, etc., and grew quite young and festive, and enjoyed my lark so much I didn’t not want to come home . . . we [Louisa and Anna] take turns and so keep our boys there eight or ten weeks.” (pg. 141, The Alcotts As I Knew Them by Clara Gowing, e-book version). 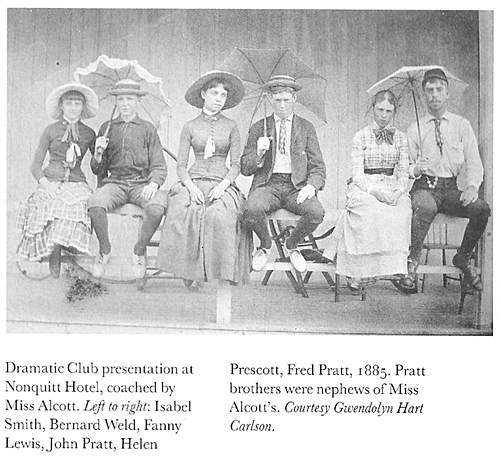 Louisa, Anna and sons Fred and John took active part in the summer theatricals (Fred and John are shown in the above picture). Having never outgrown her love of the theatre, Louisa wrote and rewrote scripts and took on the jobs of coach, scenery designer and stage manager. Always writing . . . 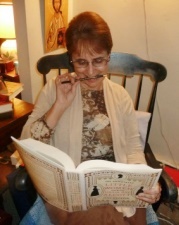 Even though Louisa came to vacation in Nonquitt, she could never stop writing. 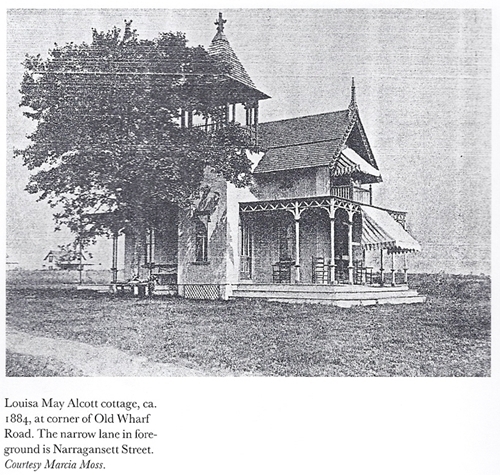 She contributed several short stories to the local paper, the Nonquitt Breeze. Louisa took her meals at the local hotel. By the end of 1885, Louisa was troubled by vertigo and rheumatism. It was then that she began to destroy letters and journals that she didn’t want prying eyes to see. She fought against her ill health and finished her last book, Jo’s Boys. 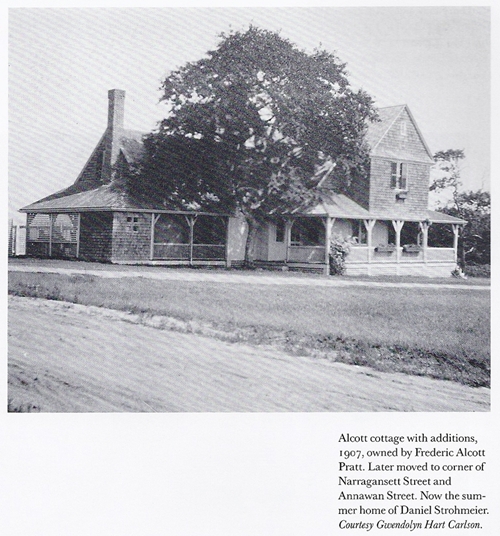 In 1888, Louisa died and the nephew she adopted, John Pratt Alcott, inherited the Nonquitt house. In 1907 it was sold to John’s brother Fred who added on to the house. In 1945 it was moved one block and is owned as of 1987 by Daniel Strohmeier. So where did I find this book? 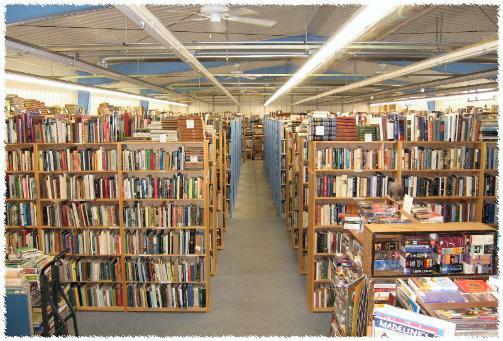 The store is known as the Book Bear in West Brookfield, MA. They are decidedly old-fashioned, not accepting credit cards and not doing email! They do have a website (click on the name) so you can get an idea of what they have. I definitely will be visiting again soon! 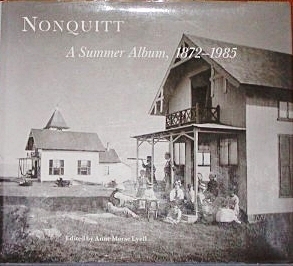 Nonquitt A Summer Album, 1872-1985 is available online through Amazon and other outlets (the link leads to Amazon). I look forward to reading the rest of this fascinating book. That’s the first photo I’ve found of an acting troupe of the period and having John and Fred in it was an extra bonus! The cottage she rented reminds me of the gingerbread cottages in Martha’s Vineyard (Oak Bluffs). I actually got to stay in one of those cottages. They are so TOTALLY cute! I also love how she is quite fashionable in the photo. Yeah, for a tomboy, she sure loved her clothes! Thanks for sharing these great photos and fascinating stories of Louisa’s later life. What I loved about it is that it made it seem like she actually enjoyed being with children. So often you read about how she disliked writing Little Women and she complained about writing “moral pap for the young” (and I’m beginning to see why), and how she didn’t like being chased by her fans. So it was utterly charming to read those accounts of her time with Lulu and the other kids. Did you know that chapter about Louisa was in the book before you came across it? That is such a great picture of her and one I don’t ever recall seeing. It was a total fluke. 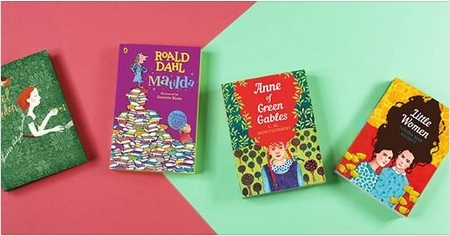 We had spent a long time at the store and I combed through many sections. The things I found were things I had already (although finding the Katharine Anthony bio with the dust jacket was pretty cool, and we also found Margaret Fuller’s treatise on 19th century women. At the end my husband was telling the owner about my interest in Louisa (he didn’t realize I had already talked to him) and the owner mentioned something about a book in the Transcendental authors section. I had looked there already but noticed this book on Nonquitt in the section next to it on New England. I remembered that she had a summer place in Nonquitt so I looked it up and viola! I was very excited to see those new pictures! Thank you for finding this book. These pictures were new to me. I love the the cottages and the picture of her nephews. What an amazing find! I love the insight into Louisa’s later life…great comment about how fashionable she looks, how she loved children, AND I love her quote that she enjoyed gossiping with the pleasant mama’s of well bred babes who played with lulu…so unlike what we usually hear about Louisa/Jo – that she didn’t like sitting around with fashionable well bred women and idiling her time away gossiping…lol…But this shows her to be much more complex than that…great stuff! Oh yes, I consider that book to be one of my best finds! Just for the pictures alone.